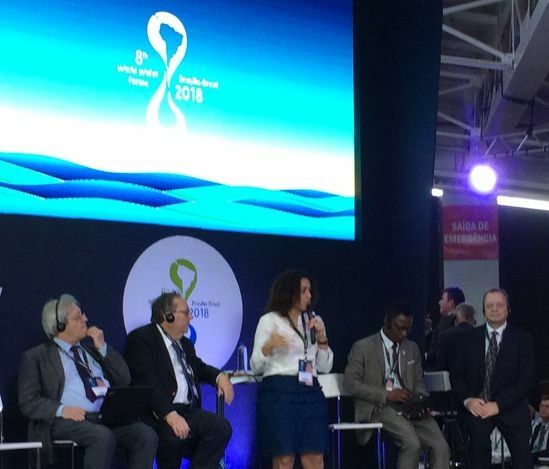 The AQUACROSS research community was represented at the 8th World Water Forum in Brasilia by four delegates: Francisco Nunes Correia, R. Andreas Kraemer and John Mathews, all three members of the AQUACROSS Think Tank, and Gonzalo Delacámara, Senior Research Fellow and Coordinator of the Department of Economic Analysis of Water at IMDEA Foundation. The Forum took place 18-23 March 2018. R. Andreas Kraemer, founder of Ecologic Institute, gave two presentations at this annual global gathering of professionals working on water resource protection, management and policy. The first presentation was on the experience of European river basin management, using the examples of the Rhine and the Danube, and the application of the subsidiarity principle in respecting municipal competences for water services. The panel, convened by Francisco Nunes Correia, author of the European Report on Water to the World Water Forum, discussed the application of the OECD Principles of Water Governance in Europe, the EU and its Member States. The panel provided an example of the real world testing of principles of good water governance that is part of AQUACROSS. The second presentation was on the role of industry in water resource management, technology and infrastructure development, and the provision of water services in Germany, within the framework of EU policy and law. The panel, convened by Percy Baptista Soares Neto of the Brazilian Confederation of Industries, discussed the diverse roles of industries in water infrastructure and services in different parts of the world. One focus was the issue of investment and full cost recovery for water services, as a precondition for the improving the management of water resources and water infrastructure, another focus of AquaCross. Gonzalo Delacámara from IMDEA Foundation, Madrid Institute of Advanced Studies in Water, moderated a round table discussion on rural sanitation.